COMMON sense says you can't build an SUV that's as quick as a sports car, even if the vehicles share a chassis and engine. Alfa Romeo knows that, which is why the Stelvio Quadrifoglio SUV comes with all-wheel drive to try to offset its extra mass and higher centre of gravity while the sporty donor, the Giulia sedan, has rear-wheel propulsion. 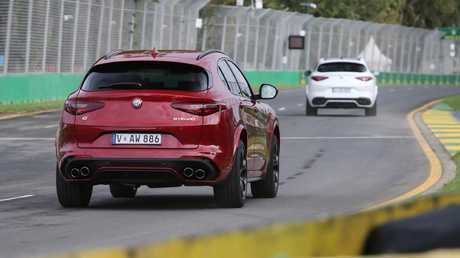 The benefit of AWD is driven home on a slick Albert Park GP circuit with the Stelvio resolutely refusing to deviate as it used all four tyres to scrabble out of the lower speed corners. In contrast the Giulia was far keener to wag its tail if you snatched too much throttle too early. The Giulia came into its own as the surface dried - and a Nurburgring lap time of seven minutes and 32 seconds against 7:51.7 for the SUV proves physics still comes into play even with all the latest technology employed. 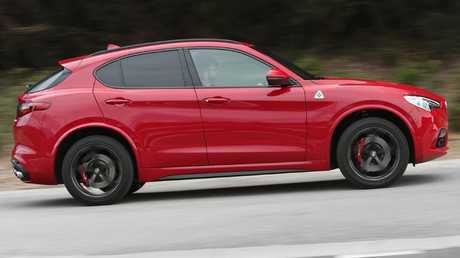 Alfa knows it has to chase buyers in the compact luxury SUV segment. The brand has no credentialled history as an SUV maker to use as marketing leverage, and has priced and specced the Stelvio QV accordingly. The $149,900 sticker price includes leather and alcantara upholstery, 8.8-inch infotainment screen with smartphone mirroring, powered front seats, carbon fibre and alloy interior trim and a set of guard-filling 20-inch wheels. The QV comes with a three-year warranty. The rest of the Stelvio range earns five-year cover - and service intervals are 12 months/15,000km, capped at $3134 for the first three trips. Being a prestige vehicle there's no shortage of options, from $1690 for metallic paint to $2400 for a sunroof and $12,000 for carbon-ceramic brakes. Technically the Stelvio QV hasn't earned an ANCAP score - the 2.0-litre petrol and 2.2-litre diesel variants get a five-star rating - but it's hard to see the V6's extra mass having much impact on the 97 per cent adult crash rating score. Default active safety includes AEB, active cruise control and lane-departure warning. Blind-spot monitoring and rear cross-traffic alert can be optioned. Luggage space is 525L with the rear seats up and, no surprise, Alfa doesn't quote a tow rating. Alfa Romeo Australia brand manager Fulvio Antonelli says the Stelvio adds practicality to the Alfa traits of emotive driving and distinctive visual and aural flair. "This is an Alfa for someone who has outgrown the Giulia. 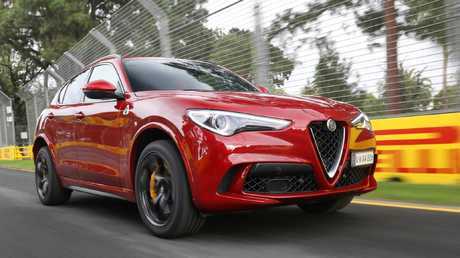 They may want the extra boot space but they're not prepared to forgo performance and the Stelvio QV makes no compromises in that regard," he says. As a performance SUV the Stelvio QV earns pole position, at least on a race track. Albert Park is a noted street circuit because it has flowing turns rather than 90-degree angles and the Stelvio excels in this environment. The steering - which we've criticised for being too reactive on the road - means you can pick a line and the soft-roader will plot it like a cartographer. There's very little lateral or longitudinal cabin movement even under the intense braking and aggressive acceleration of which the QV is more than capable. That ultra-stiff chassis and adaptive damping also make changing direction faster and smoother than a 1830kg vehicle sitting 200mm off the ground has any right to be. Then there's the engine. The Ferrari-developed 2.9-litre V6 twin-turbo is good for 375kW/600Nm and is paired with an eight-speed auto with brilliantly mapped shifts. Claimed fuel use is 10.2 L/100km, achievable providing you can resist the temptation to indulge in low-gear, high-rev exercises just to hear the exhaust note. 4.4-second run accomplished by the Audi RS Q3 and Porsche Macan Turbo S.
Alfa's flagship SUV may not be the most polished luxury soft-roader but it nails the performance brief. When the going gets tough, the Stelvio QV gets going demonstrably faster than its rivals.